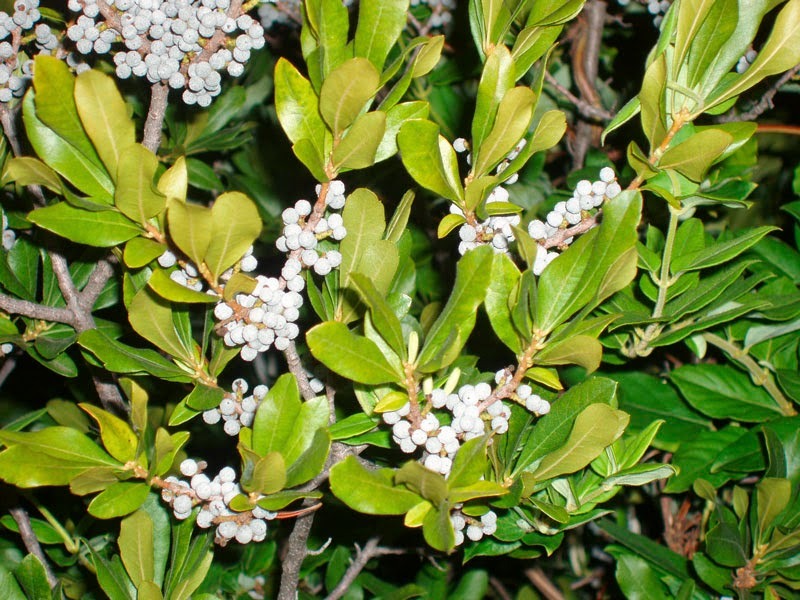 An ephemeral flowering shrub, the bayberry plant is found extensively all over the eastern as well as the southern region of the United States. This botanical species is a member of the Myricaceae family and is very well associated with the wax myrtle (botanical name, Myrica cerifera Loisel) - an even bigger evergreen shrubbery or tree, which is also referred to as the southern bayberry. Since bayberry has a beautiful curved shape, it is very popular and is normally used for landscaping purposes in the form of a small tree or trimmed to make it appear like a shrub. This plant bears simple, slender leaves of the wax myrtle variety and they vary from 1 inch to 5 inches (2.5 cm to 13 cm) in length and are approximately 0.5 inch (1.3 cm) in width. The color of the plant varies from grayish-green to yellowish-green and exudes an aroma when crushed. When you observe the surface of the bayberry leaf under a microscope, you will discover that it is swathed with minute yellow-colored glands. In fact, the wax myrtle produces numerous trunks that may each grow up to a height of 25 feet (7.6 meters) and they eventually form a colony provided the suckers are not gotten rid of. Bayberry produces flowers during the later part of winter. While the male flowers are yellowish-green catkins that grow to a maximum length of 1 inch (2.5 cm), the female flowers are comparatively smaller and not easily seen, as they are similar to small swellings which develop into tiny berries, each measuring one-eighth of an inch (0.3 cm) across and are closely held to the stem. The primary healing factor in bayberry is the fact that contains chemicals that are widely known as tannins which tends to have a drying effect on the skin. The plant itself also gives of a rather aromatic scent when it is rubbed against. 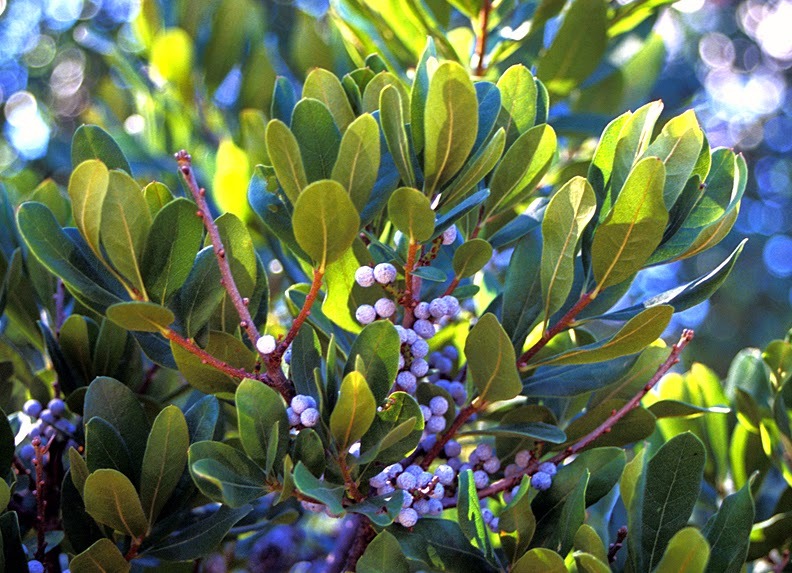 With regards to the useful parts of the bayberry shrub, it is only the bark that is really used for medicinal purposes. The bark has a white colored epidermis that can be peeled off the reddish brown layer that is hidden underneath. Many herbalists have highly praised the usefulness of bayberry and some of them have even asserted that this plant is the most valuable medication in herbalism or botanic practice. In fact, the plant's therapeutic uses have been documented in traditional medicine over the ages. A warm concoction prepared with the root bark of bayberry and southern bayberry is used in the form of an energizer and possesses invigorating as well as astringent attributes. This concoction is believed to be very effective in treating diarrhea. As the bark of bayberry triggers an exasperating action on the stomach, when taken in large doses, it works as an emetic. This herbal medication is also used to augment the discharge of nasal mucus in people suffering from head colds. In addition, bayberry formulations are also applied topically in the form of poultices to effectively treat persistent ulcers that do not heal easily. Despite the fact that none of the therapeutic properties of bayberry have been scientifically proved yet, this herb has been extensively used in traditional medicine to cure a number of health conditions. The most widespread uses of this herb are for improving the blood circulation, promoting perspiration as well as to avoid bacterial infections. It has been thought all the times that bayberry facilitates in reinforcing the opposition to infections locally. In addition, this herb is also preferred in treating common cold, coughs and flu and is considered to be helpful in constricting as well drying the mucous membranes. Taking a gargle with the herb is helpful in curing tender throats, while an infusion prepared with the root bark of bayberry is useful in making the spongy gums stronger. The astringent property of bayberry is believed to cure intestinal problems, for instance irritable bowel syndrome (IBS) as well as mucous colitis (irritable bowel syndrome distinguished by the passage of abnormally great amounts of mucus). Then again, a paste made with the powdered bayberry root bark is applied topically on the ulcers and sores. In addition, an infusion prepared with the root bark of bayberry is also believed to facilitate in treating excessive vaginal discharge. Use of bayberry for therapeutic purposes had waned since the 19th century, when the popularity of this herb was at its peak. Nevertheless, some herbal practitioners as well as common people continue to use this plant even to this day to treat diarrhea, fever and a number of other health conditions. The herb's rook bark encloses a chemical compound called myricitrin, which is known to possess anti-fever attributes. Additionally, myricitrin together with the tannins present in the herb possesses anti-diarrheal qualities. While myricitrin acts as an antibiotic, tannins enclosed by bayberry work as astringents. High blood pressure: Bayberry contains large amounts of chemicals called tannins. Tannins can increase the amount of sodium that the body retains. This can cause extra fluids to build up, and that can raise blood pressure. It’s especially important to avoid bayberry if you have high blood pressure. Water retention (edema): Bayberry might make edema worse. It’s especially important to avoid bayberry if you tend to retain water. Similar to any other therapeutic plants, bayberry ought to be used only under the guidance of a qualified physician.